A little tip for photo enthusiasts. One of the first tips I share with photo enthusiasts who attend my One2One coaching or come to my Two Passion workshops is to always look behind you. What I mean by this is that as photographers we can easily get caught up in the moment with focusing on only what we are seeing in front of us, meanwhile behind us there is an entirely different, and often captivating, scene playing itself out. Take sunsets as an example. So many of us focus on the sun disappearing into the ocean, or behind a mountain, some buildings, behind the African bush. Meanwhile behind us those last beautiful glows of the setting sun are casting some stunning soft light onto a boat, maybe reflecting off the glass of a high rise building or lighting up a lion that is about to eat you… Get your pic of the sun, however, it is good practice to keep looking about you for a different angle, a different scene. At a wedding it is obviously important to focus on and watch the bride throughout the day. However, while photographing the bride and groom, one the flower girls may be giving the pageboy a playful peck behind your back. This could be a classic image to capture as part of the special day. Be aware of these moments, be aware of your surrounds and be prepared to captured those fleeting images – they may just define you as a photographer who really is in tune with the occasion, not one who is just pointing and shooting. Now, if only I had taken my own advice above when visiting Cape Point Nature Reserve recently. After a cycle in the reserve with my two daughters we went down to a sea side picnic spot for lunch. I like to think I am pretty baboon savvy and knowing this particular spot has a resident troop of baboons I looked about carefully on arrival. 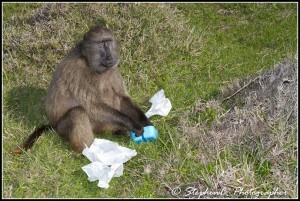 I even asked a uniformed reserve employee (I thought he was one of the baboon monitors – turned out he cleans the toilets.) if the baboons were around. Nope he said, they are way over there, pointing far down the coast. So my girls and I sat down on the grass and unpacked our lunch. Ah, nice photo opportunity I thought so I went about setting up the camera on a tripod to take a self timed photo and the girls and myself. I’m on all fours (it was a mini tripod) setting up the shot when I hear shouts from behind me. By the time I turned around to see what the commotion was about this baboon was in the middle of our picnic casually helping himself to the sandwiches while Tabi and Jaed looked on wide eyed at their new companion. All ended well though and the girls took this away as the most exciting part of their trip. And the sandwiches were pretty boring anyway.